The one-year anniversary celebration for University of Thriftsburgh, Pitt’s on-campus thrift shop, produced no waste, thanks to the Student Government Board’s environmental committee. Wednesday, Thriftsburgh took over the first floor of the O’Hara Student Center for dollar sales, music, snacks and birthday cake in celebration of its first anniversary. The hosts served all food using compostable silverware and plates, successfully making the event a zero-waste party. Joe Streets, SGB’s environmental committee chair, said he worked with Thriftsburgh’s employees to ensure their event was environmentally friendly and plans to offer this service to other student groups as well. At SGB’s weekly public meeting Wednesday, which came a day late this week, Streets said he’s working to ensure that next week’s TEDx University of Pittsburgh event would be low-waste as well. Streets said the committee has worked with paper and plastic recycling in the past, but is now also using a compost dumpster to help student groups host no-waste events — events that only produce trash that can be composted, recycled or reused. “[We are] targeting events at which we would like to compost,” Streets said. The committee’s goal is to properly sort and dispose of Pitt’s trash in an effort to keep campus clean and environmentally friendly. It has worked with several campus organizations including SGB’s food committee, the Real Food Challenge and the Engineering Student Council to organize low-waste events throughout the year. The committee hopes to create a “green event certification process,” a program in which the committee will help student groups ensure their events are environmentally friendly, and then receive a certification they can post on event advertisements and flyers. In addition to its low- and zero-waste projects, the committee is working to clarify the role of the Student Office of Sustainability in the SGB governing code. Streets said he hopes to refine the committee’s purpose in the code because its ambiguity now has hindered the organization’s impact on campus. The SOS is only mentioned once in the SGB governing code, according to the SGB governing code. The environmental committee hopes to provide a resource for students interested in sustainability through the SOS. “We are trying to change the code because the role of the Student Office of Sustainability is unclear,” Streets said. In other action, Board member Megan Murphy announced that the Chevron Science Center and Langley Hall have University printers as of last week. Murphy and Rohit Anand, transportation committee chair, have been working since last spring to install the printers, which cost around $5,000 each to purchase and install. Additionally, chairperson for TEDx University of Pittsburgh and Board member Jacky Chen said the event — which will take place March 26, in the William Pitt Union — is being finalized. He said the organizers have secured food to provide for attendees including a barista from Caffé d’Amore, food from Papa John’s Pizza, veggie plates and more. Chen also said this year’s event will be significantly better funded than it was last year because of sponsorships from UPMC and the U.S. Army, making a livestream room and several high-stakes raffles available to attendees. 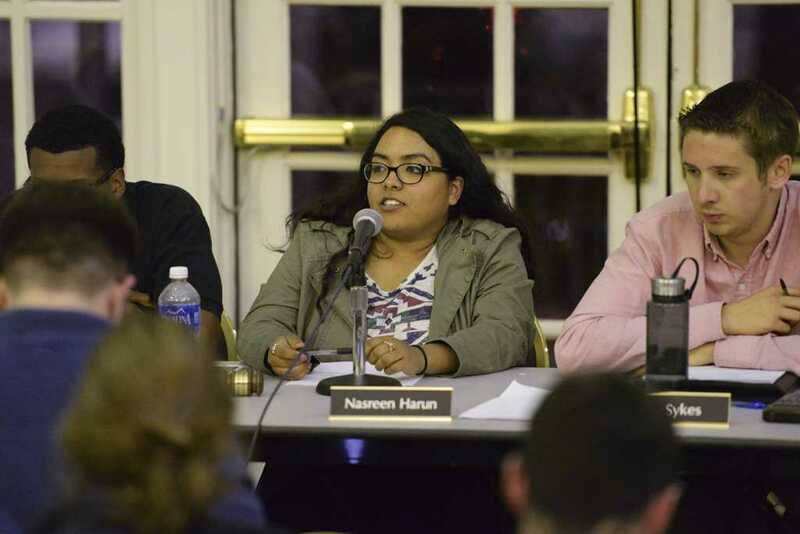 After initially planning to vote on an amendment to the allocations manual this week, the Board agreed to postpone voting on the amendment until next week, according to SGB President Nasreen Harun. Harun said the Board needed more time to finalize the wording in the amendment relating to sports nationals funding. “A wording issue came up, so we decided to table the bill in order to make it more unstable when differentiating between sport and non-sport organizations,” Harun said. The Pittsburgh Fencing Association requested $1,652.82 for transportation to the South Atlantic Conference Championships. The Board approved the request in full. The Pitt PanthEARs, a student group committed to raising awareness about hearing and hearing aids, requested $1,350.29 to send two representatives to this year’s AudiologyNOW! conference, which the group attended last year. The Board approved the request in full. The Panther Women’s Rugby Football Club requested $2,172.48 to send 32 team members to the first round of the playoffs. The Board approved the request in full. The Jain Student Association requested $5,607.00 to send their members to a national conference.